*sniff* *sniff* This was a "little" fella who grew out of my worm bin, and I decided to remove it and give it, its own home. After growing roughly 2 feet tall, and leaning over the pot, it needed some help in standing up, and so I retrieved 2 pieces of driftwood, as uprights. Today, it is doing well and may soon need taller uprights. Hopefully soon, I will be able to harvest the tomatoes. They grow up so fast. 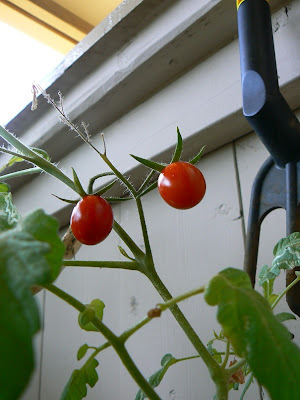 I had tomatoes that are a product of my worm bin also! :) Isn't if fabulous? Hahaha. It's like food coming out of what was supposed to be trash.